If you let the space to the occupier’s employer or company, then they are using it for a business purpose and could become a protected tenant. 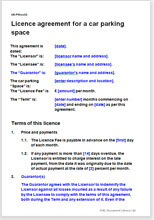 So do not use this document if your licence must be to a company. Either make sure your licensee is an individual or use Business lease: land, either vacant or with plant or buildings.